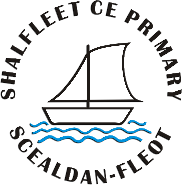 We are the Reception class at Shalfleet CE Primary and take the youngest children in our school. This year (September 2018) Rainbow class will have Mrs Lucie Thurman as class teacher Monday, Tuesday morning, Thursday and Friday and Mrs Jacqui Tinsley on Tuesday afternoon and Wednesday. Mrs Lindsey Cox will remain as teaching assistant every day. Mrs Heather Eggleton will be in class in the mornings, Miss Emma Lucas in the afternoons & Mrs Debbie Munn on a Friday afternoon. We work closely with the onsite Little Explorers pre-school as we are the final year of the Early Years Foundation Stage and our task is to prepare the children for Year 1, when the National Curriculum starts. The Early Years curriculum is based on the development of social skills, physical skills and communication. When children are ready we move on to teaching phonic skills, leading to reading and writing, maths, exploring the world and creative development. We aim to work closely with parents to make the children’s experience of starting school a happy one, and welcome parents in to class to play alongside their child. In their first term in school children are settling in, learning the expectations and how to play together. We are introducing phonics, that is how each letter sounds, and starting to write some letters and to read simple words. YR MTP Autumn 2 – Let’s Celebrate! YR MTP Spring 1 – It’s Showtime!